POMONA – Racers woke up to rain showers Saturday morning at the NHRA Winternationals. The early morning showers eventually passed mid-morning. After a lengthy delay, sportsman racers hit the track just before noon. The original schedule called for each sportsman class to race down to the final four competitors. Although, the schedule was changed due to the early morning rain. So instead of two or three rounds of competition, sportsman racers hit the track only once on Saturday. Updates for each class are listed below. Check out our Sportsman Preview article here and our Day 2 Recap here. Number 1 qualifier Ed Ferderkeil Jr. broke in the burnout during the first round. This allowed Josh Lee to take the free pass and will definitely change the complexion of the race on Sunday. Team DragChamp pick Doug Lambeck moved into the second round after defeating John Clegg. Redlights were the trend in Round 3 of Super Stock as five match-ups were determined by a redlight. Notables moving into the fourth round include Justin Lamb, Jody Lang, Kyle Rizzoli, and Ryan McClanahan. Team DragChamp is still alive for the win as both Justin Lamb and Jody Lang will compete on Sunday. As with Super Stock, all but two Round 3 match-ups (one being the bye run) were determined by a foul start. With just eight competitors left for Sunday’s Round 4, those left in competition have to like their chances to win the event. Team DragChamp picks Dan Fletcher and Leo Glasbrener both made it through Saturday’s Round 3. But, they will meet each other in Round 4 on Sunday. I still like our chances as one of these driver’s will reach the semifinals. Other notables still in competition include Jody Lang and Cody Lane. Lang will be looking to double up on Sunday as he is still alive in Super Stock as well. Reigning Super Stock world champ Justin Lamb’s run in Super Comp ended with a red-light in Round 3. Lamb turned it red by just -.002 allowing Kevin Wright to move on. The Torres family went two-for-three on Saturday as Val and Val Jr. found win lights. Gabriel came up short against Mark Darsow after both drivers ran well over the index. Just six cars remain in Super Comp for Sunday’s fourth round. Team DragChamp pick Val Torres Jr. will have a possible match-up with his father Val if both make it to the semifinals. The changing weather conditions on Saturday did little to affect the setups in Super Gas. Most of the Round 3 competitors were dialed very close to the index after a big change in weather and track conditions. It’s surprising just how good NHRA racers are at figuring out the weather and track conditions day after day at national events. Evan Kowalski, Ed Olpin Jr., Greg Ventura, Pete Zak, Randy Kersey, Ray Cordeiro, and Mike Wiblishouser will fight it out on Sunday to determine a champion. 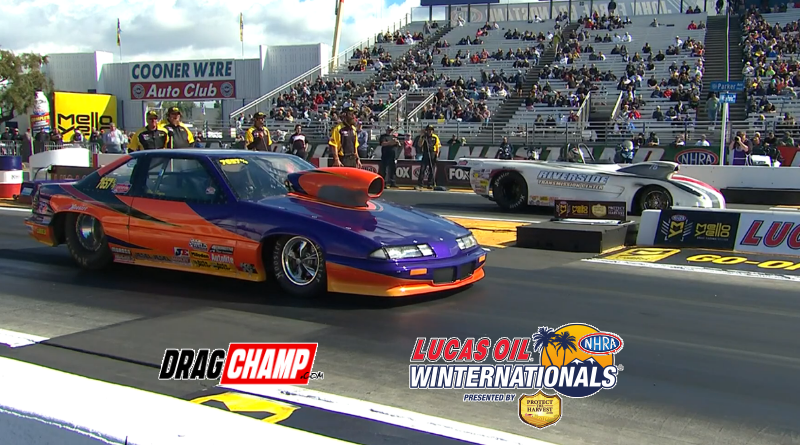 The last Super Gas member of Team DragChamp, Kevin McClelland fell in Round 3. Kevin lost a close break-out decision to Cordeiro. After two rounds of competition, just eight racers remain in Top Sportsman. These eight will battle for the championship on Sunday. Team DragChamp picks Ed Olpin and Mike Ferderer are still alive. The “Ferd” will meet Phil Unruh in Round 3 while Olpin will race Will Yakimetz. Eight of the top racers in the country remain in competition in the Top Dragster class. Kevin Brannon, Mike MacBrair, Ed Olpin, Phil Unruh, world champ Paul Nero, Trevor Ritchie, John Taylor Jr., and Zach Sackman make up the final eight. Tomorrow’s champion will definitely have earned their title after wading through these shark-filled waters. Team DragChamp pick Phil Unruh hopes to double as he’s still alive in Top Sportsman too. Ed Olpin, no stranger to double-ups, also has a shot at the double on Sunday. Visit DragChamp for daily updates from all of the NHRA national events. DragChamp is your source for NHRA drag race results online.